Fatty liver disease is one of the most common liver dysfunction where the triglyceride fat accumulates in liver cells. The major causes of fatty liver disease are obesity and excessive alcohol consumption. The major risks associated with fatty liver disease are alcoholic cirrhosis, cardiovascular disorder, metabolic syndrome and biliary cirrhosis among others. It is expected to be one of the leading causes of hepatocellular carcinoma. The technological advancements and the routine liver function tests have increased the detection of fatty liver disease in the early stage. The increase in incidence of fatty liver disease associated with excessive alcohol intake is expected to create an opportunity for the treatment market during the forecast period. The market for overall fatty liver treatment is expected to grow significantly owing to the availability of a variety of agents for fatty liver treatment. However, the market growth can be restrained owing to the side effects associated with the treatment, coupled with stringent regulatory requirements. This report identifies the global fatty Liver Treatment market size in for the year 2014-2016, and forecast of the same for year 2021. 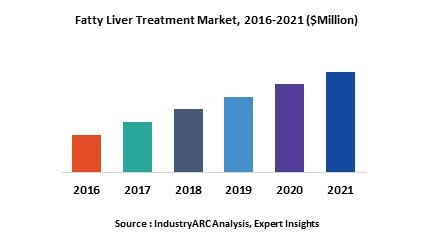 It also highlights the potential growth opportunities in the coming years, while also reviewing the market drivers, restraints, growth indicators, challenges, market dynamics, competitive landscape, and other key aspects with respect to global fatty Liver Treatment market. Geographically, North America is estimated to hold the largest share in the fatty liver treatment market. Asia-Pacific is estimated to witness the highest growth during the forecast period in the fatty liver treatment market owing to rising drug and alcohol abuse coupled with increasing incidences of lifestyle related diseases.